Digital Clutter | What are winning organisations doing differently? The digital revolution was and is awesome. It gave unprecedented power to the restless and frustrated youth, the free thinkers, the nerdy, the challengers, our then senior peers hated it or were deeply suspicious. It’s spawned huge amounts of innovation and change and made it cheap to market to a global audience. Whole new job roles and specialised industries were born. Giants were battered and toppled. New, fresh and on-demand services emerged from new collaborations. But. It’s going wrong, really wrong for most businesses. Online advertising is stalling and becoming expensive, and this will be a continuing trend as businesses fight for users attention for their products and services. The traditional strong values of good business have become just standard expectations now. Businesses propositions have become commoditised; the consumer has never had so much choice of the same. The online space has become saturated and cluttered with messages and promises. Use a standard search for your type of business and hundreds of thousands if not millions of SERPs appear. If you are lucky to get some paid media chick thoughts, the bounce rate can be 85% and dwell time in the seconds. Your costs of advertising will keep getting higher, shouting to an increasingly disinterested audience who are thinking so what or just transactional, price. The business world has become saturated, stuffed and cluttered. Businesses especially disrupted ones, are feeling the pinch as the once steady stream of customers begin to look elsewhere. So what are the winning organisations doing so differently? Winning organisations are treating customers as tribes. Tribes that are looking for something to believe in. Tribes that are looking to buy into a new belief system or alternative thinking that has meaning to them. Highly connected digital Tribes that are looking for authenticity and quickly spot the fake and insincere. But if you get it right, understand them, engage them and keep them engaged, the market share is yours for the taking. Gone is biased lending, to suppress challengers, yes the banks did this to protect their investments from disruption. Now we have a choice in financing, we have crowdfunding and peer to peer lending. We even have blockchain cryptocurrencies like bitcoin and many others. It takes some bold alternative thinking. Dollar shave is my personal favourite. Gillette scoffed at the upstart or probably did not even notice the man essentially his garage making razor blades. The proposition and how it fits the zeitgeist is everything. Unilever brought Dollar Shave Club for $1 billion in 2016. Yep, that’s right 1 Billion US $. In response to Unilever grabbing a healthy slice. Gillette one-ups (Really) Dollar Shave Club with on-demand razor ordering service where you text to order. Zzzzzzzzz. But. Did Dollar Shave lose some authenticity value? Yes, no doubt about that. The tribes noticed and started to walk away; the corporates tried hard with their marketing machine which served only to compound the problem of the brand becoming inauthentic and mainstream. So to overcome the saturation you need to take a prudent step, go for something bigger, something else, something real and authentic. But first, as you have to find your tribe. Where they hunt. Where they hang out and speak to the like them. You online dominance starts with your proposition. Your tribe, if they are interested, will do the rest. 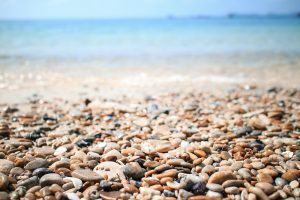 Avoid being just another pebble on the beach.